The 2004–05 National Division One was the 18th full season of rugby union within the second tier of the English league system, currently known as the RFU Championship. New teams to the division included Rotherham Titans who were demoted from the 2003-04 Zurich Premiership while Sedgley Park and Nottingham were promoted from the 2003–04 National Division Two. Rotherham almost went into liquidation and dropped out of the leagues following their relegation from the Premiership but were saved by a local consortium which enabled them to continue playing in National One. As well as new teams Coventry had a new ground, moving from Coundon Road to the smaller but more modern Butts Park Arena. By the end of the season, after two seasons spent in the division, Bristol Shoguns became champions and were promoted back to the Guinness Premiership for season 2005–06. Exeter Chiefs were runners–up, and Orrell (last seasons runners–up) along with Henley were relegated to the 2005–06 National Division Two. Points are awarded as follows: four points for a win; two points for a draw; no points for a loss; one bonus point for scoring four tries or more in a match; one bonus point for losing by seven points or less. If teams are level at any stage, tiebreakers are applied in the following order: (1) difference between points for and against; (2) total number of points for. Postponed. Game rescheduled to 12 February 2005. Despite earlier winning the game 22-15 Coventry were in breach of RFU principal regulation 11.4 and the Titans were awarded the win. Postponed. Game rescheduled to 5 March 2005. Postponed. Game rescheduled to 5 February 2005. Postponed. Game rescheduled to 19 March 2005. ^ Note that 24 home attendances are missing (see below) - so the total attendance will not be 100% accurate. The average attendance has also been taken into account with the missing games not included. ^ Missing home attendances v Sedgley Park on 4 December 2004, Orrell on 8 January 2005, Penzance & Newlyn on 15 January 2005, Plymouth Albion on 19 February 2005 and Bedford Blues on 30 April 2005. ^ Missing home attendances v Plymouth Albion on 20 November 2004 and Rotherham on 23 April 2005. ^ Missing home attendances v Pertemps Bees on 26 March 2005. ^ Missing home attendance v Sedgley Park on 26 March 2005. 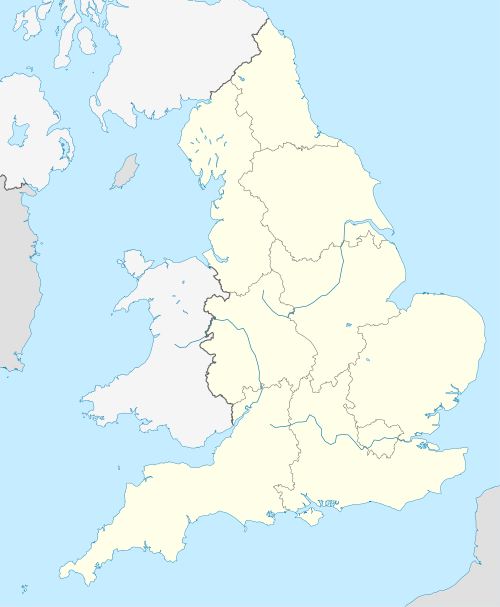 ^ Missing home attendances v Penzance & Newlyn on 23 October 2004, Rotherham Titans on 27 December 2004, Nottingham on 8 January 2005, Sedgley Park on 22 January 2005, Pertemps Bees on 29 January 2005, Coventry on 2 April 2005, Plymouth Albion on 23 April 2005 and Bristol Shoguns on 30 April 2005. ^ Missing home attendance v Otley on 26 February 2005. ^ Missing home attendances v Plymouth Albion on 23 October 2004, Nottingham on 13 November 2004, Orrell on 22 January 2005 and Bedford Blues on 9 April 2005. ^ Missing home attendance v Plymouth Albion on 2 October 2004. Note that points scorers includes tries as well as conversions, penalties and drop goals. ^ As there are a number of attendances missing this season it is possible that there were lower attendances than the one recorded. ^ As Orrell had 1 home game missing from the attendance statistics this figure is not 100% accurate. ^ "Rotherham 21-35 Gloucester". BBC Sport. 22 February 2004. ^ "Rugby union: Champs crush battling Lions; RUGBY LIONS 35 SEDGLEY PARK". Sunday Mercury. 17 April 2004. ^ "Final League Tables – 2003/04 Season". Moseley Rugby. 24 April 2004. ^ "Rotherham back from the brink". The Telegraph. 10 September 2004. ^ "Coventry learn harsh lesson". The Telegraph. 15 March 2004. ^ "Coventry Rugby Club History". Coventry RFC. Archived from the original on 14 September 2014. Retrieved 17 January 2016. ^ "Bristol get promotion green light". BBC Sport. 29 April 2005. ^ "Titans fans robbed of quality". rugbynetwork.net. 24 April 2005. ^ "Rugby Union: New Owners Beckon as Orrell Are Relegated; Orrell". Daily Post. 6 April 2005. ^ "Leagues 2004/05". Moseley Rugby club. Retrieved 13 August 2012. ^ "Final League Tables 2004-05". Trelawny's Army. Retrieved 16 August 2012. ^ "Shelbourne leaves it late". Western Morning News. 28 December 2004. ^ "National One 04/05 Home attendances". Rugby Statbunker. 30 April 2005. ^ "National One 04/05 Leading point scorers". Rugby Statbunker. 30 April 2005. ^ "National One 04/05 Leading try scorers". Rugby Statbunker. 30 April 2005. ^ "National One 04/05 Most tries in a match (Team)". Rugby Statbunker. 30 April 2005. ^ "National One 04/05 Most conversions in a match (Team)". Rugby Statbunker. 30 April 2005. ^ "National One 04/05 Most penalties in a match (Team)". Rugby Statbunker. 30 April 2005. ^ "National One 04/05 Most drop goals in a match (Team)". Rugby Statbunker. 30 April 2005. ^ "National One 04/05 Most points in a match (Player)". Rugby Statbunker. 30 April 2005. ^ "National One 04/05 Most tries in a match (Player)". Rugby Statbunker. 30 April 2005. ^ "National One 04/05 Most conversions in a match (Player)". Rugby Statbunker. 30 April 2005. ^ "National One 04/05 Most penalties in a match (Player)". Rugby Statbunker. 30 April 2005. ^ "National One 04/05 Most drop goals in a match (Player)". Rugby Statbunker. 30 April 2005. ^ "National One 04/05 Home attendance". Rugby Statbunker. 30 April 2005.